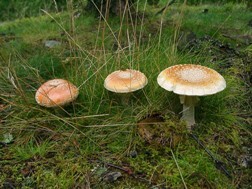 Within the species of Amanita muscaria, there is a high degree of variation. Studies conducted by Jozsef Geml, et. al., proved via observation and molecular tests that "A. muscaria has strong intracontinental genetic disjunctions" and distinct variation in appearance between geographic locations (Geml. et. al.). 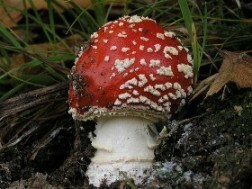 In addition, the concentrations of toxins in A. muscaria are quite variable. This variability has an impact on a number of characteristics and makes it absolutely vital that mushroom gatherers are able to identify the various sub-species of A. muscaria. The color of A. muscaria is probably its most obvious variable trait. Depending on location and conditions, the color of the cap ranges from a bright red (below left) to white (below right). Due to the variability of toxin concentration in A. muscaria, it can be a hallucinogenic and/or poisonous mushroom. 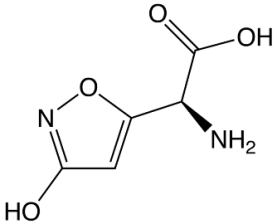 Two isoxazole derivatives, ibotenic acid and muscimol (see below), have been identified as the primary toxins of A. muscaria. These chemicals act on the nervous system as neuropeptide receptors to induce the inebriating effect. The concentration of these, in addition to other toxic compounds, varies greatly between locations. Someone could consume A. muscaria in one location and feel only the hallucinogenic effects while another could consume it in another location and become severely nauseated. To continue our journey through the world of Amanita muscaria, we will look at geographic locations it inhabits on the Habitat page.